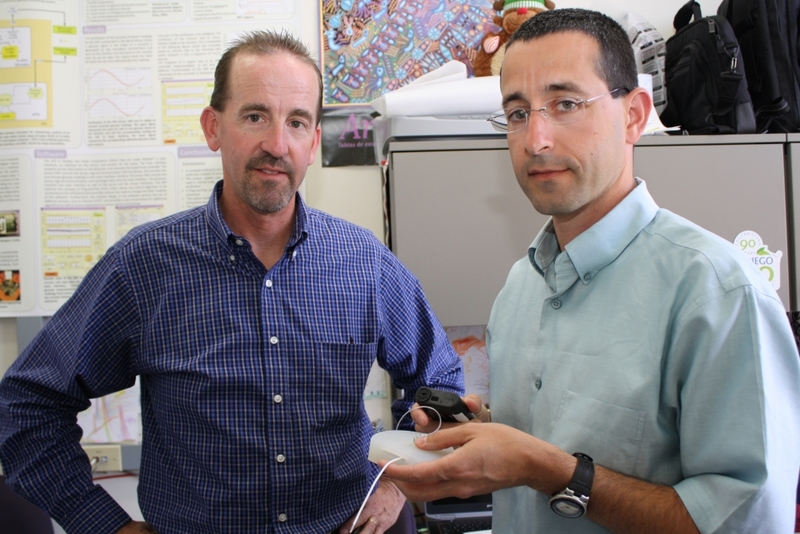 UCSB chemical engineers Frank Doyle and Eyal Dassau with a model of their artificial pancreas for adults. 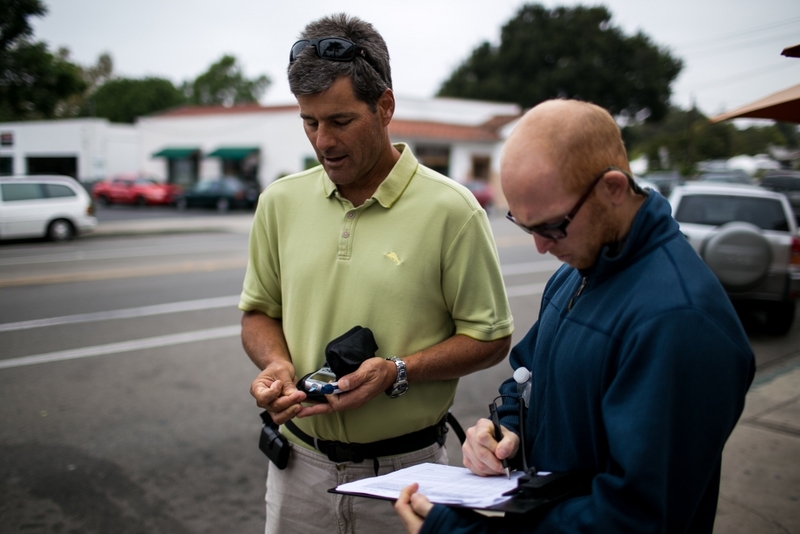 Eyal Dassau and volunteers field test the adult artificial pancreas in Santa Barbara by taking a walk, periodically monitoring their glucose. Anyone who lives with Type 1 diabetes is all too familiar with the sheer amount of effort — and often round-the-clock attention — required to manage the disease. Food intake is closely monitored, as is physical activity, and the period between meals is carefully tracked in order to calculate appropriate insulin dosages, which have to be delivered at the right time. All this to keep blood glucose levels within a healthy range. For parents of children with Type 1 diabetes, the stress is amplified. Childrens’ unpredictable eating habits and food preferences, spontaneous physical activity and sensitivity to insulin require parents to be extra vigilant. The dreaded overnight hypoglycemia — a condition in which glucose levels drop to dangerously low levels between dinner and breakfast — requires parents to interrupt their own sleep habits so they can check their children’s blood sugar and give the child a snack if needed. Conversely, if the glucose reading is too high, they would need to administer insulin . And those eagerly anticipated birthday parties (complete with cake and ice cream), sleepovers and playdates? Only if the other parents involved can be trusted to monitor the child closely and respond to emergencies. But with a $1.8-million, three-year grant from the National Institutes of Health, UC Santa Barbara chemical engineers Frank Doyle and Eyal Dassau and Yale University’s Dr. Stuart Weinzimer could make such hands-on care a thing of the past. And it could happen within a decade. The researchers and their teams are embarking on the development of artificial pancreas (AP) for children. The grant is the UCSB researchers’ first award for a pediatric closed-loop study. 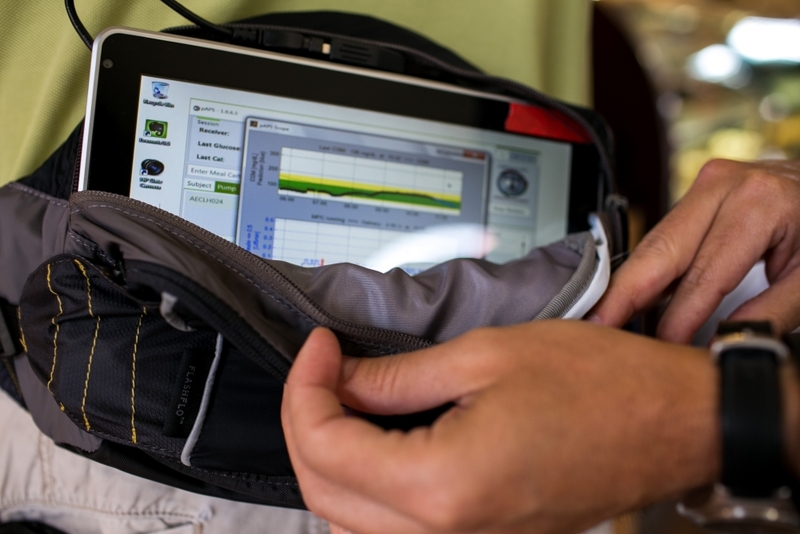 Over the past 12 years, Doyle, director of the Institute for Collaborative Biotechnologies at UCSB, and his research group have developed the artificial pancreas, a combination of sensor technology and insulin pump, which, thanks to a control algorithm, reads levels of glucose and injects the appropriate amount of insulin based on the data, and the patient’s individual characteristics. Thus far, the researchers have made great strides in developing UCSB’s AP for use in adults. In a collaboration with the William Sansum Diabetes Research Center in Santa Barbara, and in local and international clinical trials, the AP’s multi-national team of researchers has been refining the device based on input from engineering, clinical and behavioral aspects of diabetes management. Tailoring the device to manage pediatric diabetes, however, requires the researchers to consider an additional set of factors. “Children have unpredictable eating habits,” said Dassau. “You can put a certain amount of food in front of them, but you don’t know whether they’re going to eat it all.” Additionally, they may graze throughout the day, and tend to be more spontaneous than adults with their physical activity. Also coming into play are the children’s general lack of awareness about their condition and their limited ability to inform parents and caregivers of any immediate health situations. The protocols for diabetes management vary by age as well. With adults and teenagers who can predict their meals and mealtimes, insulin can be delivered subcutaneously about 15 minutes before eating to ensure an adequate amount of the hormone has reached the bloodstream by the time they eat. This “pre-meal bolus” is an ideal way to manage meal glucose control, as it allows insulin to be absorbed when the glucose surge arrives with the meal, and mimics as closely as possible the way a healthy individual’s body regulates blood sugar. However, in younger children with Type 1 diabetes, because of unpredictable eating habits and higher sensitivity to insulin, the hormone must be delivered after the meal, which creates both a delay and the chance of a swing to the hypoglycemic extreme of the blood sugar range, due to the tendency to overcompensate. According to the researchers, the first phase of research for the pediatric AP involves data collection. With clinical expertise from Weinzimer, a pediatric endocrinologist, professor at Yale School of Medicine and a leading expert on Type 1 diabetes in children, the researchers will tune the AP’s Zone MPC (model predictive control) algorithm to meet the specific challenges of managing pediatric diabetes. “I would look for the following things in a pediatric version of an AP: safety above all; efficacy; reliability; and ease of use,” said Weinzimer. In addition to protecting against constant wild swings in blood sugar, which would in turn alleviate the high rates of anxiety, depression, and burnout in parents, and prevent the additional problem of disrupted psychosocial development in children with Type 1 diabetes he said, the device itself must perform in a predictable manner and not be overly complicated or burdensome to use. Because insulin requirements change as the child gets older, the algorithm will be adjusted and refined according to different age groups, the researchers noted. The second phase of the project involves developing and in-clinic testing of an advisory system and an alert system for parents that both provides insight on strategies for the management of their children’s conditions in general, and informs them of impending hypo- or hyperglycemia. At every phase, the researchers will conduct repeated evaluations and refinements to the algorithm as well as to the alert and advisory systems. The goal is to give parents and children the ability to be involved in the management of diabetes to the extent that they can be, while safeguarding against extremes when unexpected circumstances arise. Snacking, unscheduled naps, spur-of-the-moment activities or missed meals will no longer result in increased stress levels for both parents and children. According to Doyle, who holds the Mellichamp Chair in Process Control at UCSB, when his group started work on the artificial pancreas over a decade ago, the researchers found that subjects using the conventional multiple daily injection method of controlling blood sugar were able to keep their glucose level in a safe range for only slightly over 50 percent of the time. “In our most recent trials, we have demonstrated that our algorithms can keep subjects in a safe range for 80 percent or more of the time,” he said. The UCSB AP’s Health Monitoring System sends user alerts in the form of messages and audible signals when problems arise, such as blood sugars that are trending low. Additionally, Doyle’s AP researchers have two other active grants funding research to examine how the device can monitor its own operations and alert users to potential malfunctions. In future studies, pediatric AP testing will move to an outpatient component, in which subjects are given free rein over what they eat and do, but at locations near the clinic, with supervision from technical staff. Research for the development of this artificial pancreas is supported by the National Institutes of Health, award number DP3DK104057.